'Offender' is a hard-hitting British thriller, from first-time director Ron Scalpello. His brutal debut is set in a young offenders’ institution at the time of the London Riots and stars young 'Skins' actor Joe Cole as an underdog possessed by the need to exact his own personal justice on those that have ruined his life. It begins as gang of opportunistic young criminals use the chaos of the 2011 Riots raid a jewellery shop, but everything goes horribly wrong. In the process of covering up an unintended murder during the armed robbery, they attack a young woman (Kimberley Nixon) who knows too much. This is where the plot gets relatively Swiss-cheese-like as her violent beating causes her boyfriend Tommy (Joe Cole) to seek revenge on the men responsible. But first he has to land himself in notorious young offender’s institution Feltham so he can exact his vengeance. Like most revenge thrillers, the lead is singularly minded in achieving the retribution he craves and Joe Cole does a good job of showing the emotional journey that Tommy goes through. He starts off as a devoted and hardworking young man, and transitions into an ultra-violent psychopath, akin to Paul Bettany in 'Gangster No.1'. 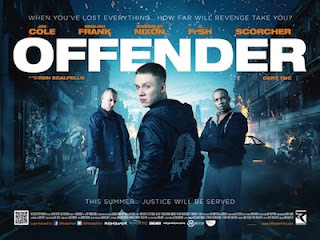 The supporting cast are equally convincing as a bunch of low life criminals, with UK underground rap artists English Frank, G-FrSH and Scorcher making their acting debut and presenting an authentic representation of teen thugs immersed in gang culture and crime. But their acting inexperience occasionally reveals itself in over exaggerated facial expressions and a propensity for mumbling street slang, which means that sections of dialogue are virtually incomprehensible to those unfamiliar with the vernacular. 'Offender' is effectively gritty, brutal and hard-hitting, but the violence it seeks to condemn it also glorifies, and there is a relentless onslaught of stomach-churning scenes of violence that at times are just too much. As a modern update of Alan Clarke’s celebrated 1979 crime drama 'Scum', it succeeds in holding a magnifying glass to the prison youth system, and but the film lets itself down by playing too much to conventions and archetypes of the prison genre (clichés include a bent prison warden and familiar shower fight scene). Despite being his debut feature, Scalpello is a skilled director and the cinematography, lighting and use of angles inside the prison really evoke a bleak and claustrophobic atmosphere. 'The Bill'-style shaky hand held cameras are clumsy and unnecessary, but overall he does a good job of keeping up the tension within 'Offender'. The Riots take a back seat to the narrative, but are effectively utilised to provide much needed weight to this plot-hole ridden crime drama. One of the main problems within the film is the ham-fisted way it tries to hammer home messages about ‘Broken Britain’ and the rise of gang culture and in the wake of 'Kidulthood', 'Shank' and most recently, 'Ill Manors', British cinema is becoming a bit too repetitive in its representation of this sub-section of society. The film will appeal to a young urban audience, who wont be put off by the shaky cameras and thumping drum and bass soundtrack. Despite any narrative problems though, 'Offender' successfully delves into the harsh realities of urban life in London and its lead Joe Cole more than carries the film with his memorable onscreen presence and emotive performance. Evoking the grief of a man destroyed, he effectively wins over the audience as a teen thug who has found himself on an irreversible journey through a terrible system. 'Offender' is out today in UK cinemas through Revolver Entertainment.